As always this night is all about the MUSIC. After The Ballantynes and Isaac Rother treat us to their excellent take on some vintage 60s sounds, expect to hear resident DJs Dave Mac and Keith McCafferty play selections from this glorious genre known as SOUL in all its glory. 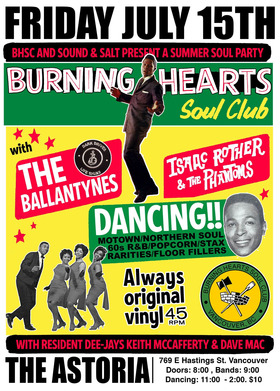 From down and dirty early 60s R&B to hard hitting 70s funk to the Motown/Stax classics you know and love to that northern soul beat that is perfect for moving your feet. Of course, at BHSC these tunes are always heard the way god intended; off of all original vinyl @ 45 RPM and we GUARANTEE you will hear new and different tunes each month.